I am so excited about the new Les Mills Combat workout available now. This super high energy home program will help you tone and shape, and increase your strength and endurance. It’s an empowering cardio workout that is martial arts inspired. It draws on many disciplines such as boxing, muay thai, taekwondo, kickboxing, jui-jitsu, karate, and capoeira! You will be punching and kicking your way to an amazing body transformation. The variety of music tracks is incredible and you’ll be driving every punch to the beat of it. Les Mills Combat has it all! What’s included with Les Mills Combat? This workout is still in development and very hush-hush. All I know is you’ll be lead through a series of fight combinations and moves from a set of 7 workout DVDs over the course of 60 days. this is a full blown workout friends. It will have a nutrition guide, fitness guide, schedule and, well you get the picture! You’ll be focusing on speed, power, and endurance. Don’t worry, you’ll have time to recover too! I can’t wait! 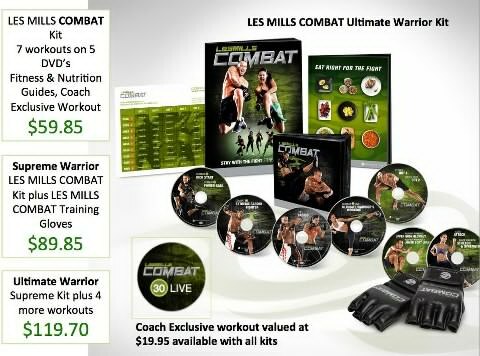 “Les Mills Combat” is available now and shipping. It’s the perfect holiday gift! Can’t wait? Get the Les Mills Pump Combat DVD, available as part of the Pump advanced workout set and start practicing, you’ll need it. Price of kits: Regular $60, Supreme is $90 and Warrior is $120. Includes FREE shipping and bonus workout! Ready to burn some calories? Click here to order on Oct 1!